Outraged MPs are demanding the Government to appoint a ‘minister for hunger’ amid soaring numbers of families that can’t afford to eat. An influential Parliamentary committee has warned millions of vulnerable people, including children, are ‘falling between the cracks’ of national policy. The Environmental Audit Committee quoted Unicef figures, which found one in five children under 15 in the UK live with an adult who is food insecure. Food insecurity is defined by the 16-MP strong group as ‘limited access to food… due to lack of money or other resources’. The group called for the new post to oversee a cross-Government plan to tackle the scandal. The demand for the new minister comes amid Britain’s well-known struggle with an obesity crisis, branded by some experts as the biggest health crisis of our time. Figures show nearly a third of children and two in three adults are overweight or obese. 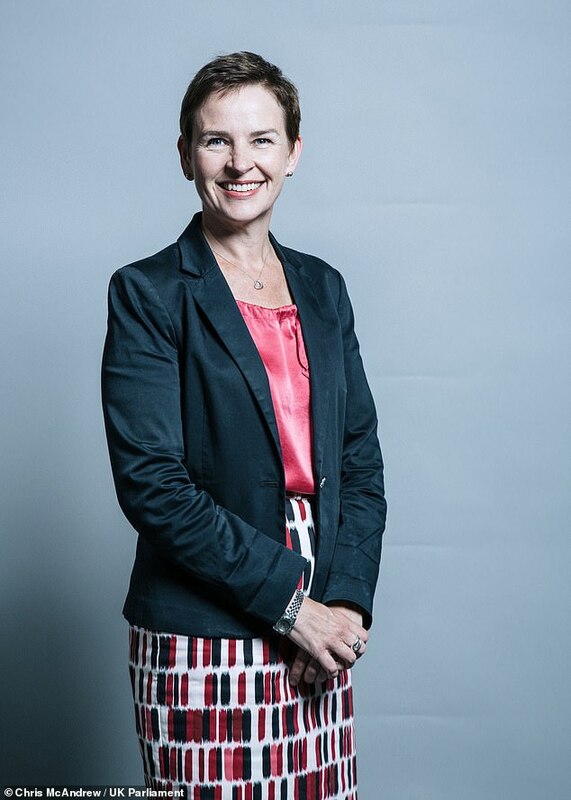 Labour’s Mary Creagh, who leads the EAC, said ‘more children are growing up in homes where parents don’t have enough money to put food on the table’. She described it as a ‘sad fact’ and blamed the ‘combination of high living costs and stagnating wages’. Ms Creagh also warned the rollout of Universal Credit and the wider benefits system, explain why levels of hunger in Britain are some of the highest across Europe. ‘We found that nearly one in five children under 15 are living in a food insecure home – a scandal which cannot be allowed to continue,’ she added. HOW FAT ARE BRITISH CHILDREN? English children are fatter than ever – official data revealed in October that one in every 25 10 to 11-year-olds are severely obese, the fattest possible category. And out of around 556,000 children of primary school-leaving age in the UK, 170,000 are overweight to some degree, figures showed in May. More than one in ever five 11-year-olds are obese – equivalent to around 111,000 children – and being so fat means they are more likely to develop type 2 diabetes, heart disease, cancer or have a stroke. The Royal College of Paediatrics and Child Health say children should be weighed every year at school because ‘danger is on the horizon’ and the UK is lagging behind the rest of the EU in tackling obesity. 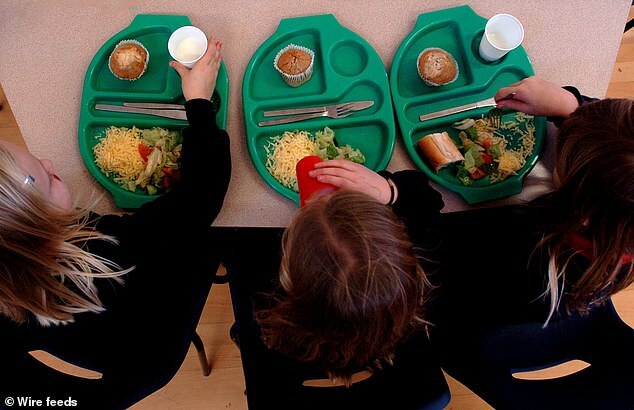 Experts have also warned children gain weight ‘at a drastic rate’ when they’re at school. Sugar in food is known to be contributing to the swelling waistlines of children, with huge amounts of popular foods crammed full of sugar. A sugar tax has reduced the effects of some soft drinks, but breakfast cereals can still contain more than 70 per cent of an entire day’s sugar in a single bowl. Even a single can of Coca Cola (35g of sugar) or one Mars bar (33g) contain more than the maximum amount of sugar a child should have over a whole day. ‘Unless we tackle this obesity crisis, today’s obese children will become tomorrow’s obese adults whose years of healthy life will be shortened by a whole host of health problems,’ Izzi Seccombe, of the Local Government Association, said in May. ‘Instead of seeing hunger as an issue abroad, the Government’s New Year resolution should be one of taking urgent action at home to tackle hunger and malnutrition. In its report, the committee found the Government’s widely publicised obesity strategy made no mention of ‘food insecurity’. The EAC said there is a ‘doughnut-shaped hole’ in the UK’s attempts to meet a UN goal of zero hunger and malnutrition by 2030. Also, the only ministry with a formal plan to tackle hunger was International Development, which is responsible for challenges overseas. The report quoted Unicef figures which found one in five children under 15 in the UK live with an adult who was moderately or severely food insecure. 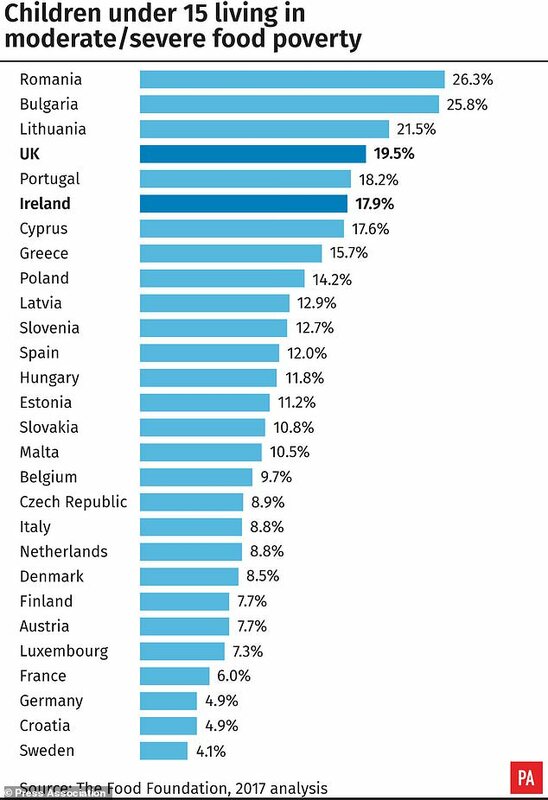 The unemployed, poor, the disabled and single parents are among the most likely to be affected. The British Association for Parenteral and Enteral Nutrition (Bapen) said there are three million ‘undernourished’ people in the UK. The report said: ‘Food insecurity is a significant and growing issue in the UK, with figures from The Food and Agriculture Organisation and The Food Foundation showing that levels are among the worst, if not the worst-in Europe, especially for children. ‘The issues of food insecurity, hunger, malnutrition and obesity should be considered in parallel in the UK context as they are often co-located and correlated. It comes after it was revealed last week that more than 41,000 overweight people needed joint replacement operations last year as health chiefs warn of a national crisis of obesity. Patients going for surgery to replace knees or hips has soared six-fold in just eight years, from 6,191 in 2009-2010 to 41,761 in 2017-2018. Seven teenage girls were included in the number and the 575 per cent rise in such procedures is costing the NHS £200million a year. Health officials called the findings of The Sunday Times investigation ‘horrifying’ and warned of a ‘national obesity crisis’.